JERUSALEM—Harsh new economic measures against Hezbollah in Lebanon won’t directly impact funding for the terrorist group, according to its leader. The stopgap U.S. measure against Hezbollah’s use of the Lebanese banking system takes aim at funding sources including narco-trafficking and money laundering. Dubbed the Hezbollah International Financing Prevention Act, it was enacted by Congress at the end of 2015. In June, Hezbollah chief Hassan Nasrallah said economic sanctions put in place by the United States to block income via Lebanese banks will have no impact on the true source of the group’s money: Iran. Since the start of the war in Syria in 2010, Hezbollah has become a growing regional threat as the military henchmen of Iran. This is despite the fact that the Shiite group is part of Lebanon’s government. Nasrallah has also openly bragged about Hezbollah’s contributions to the war in Syria. Last week, he announced that the group will send more fighters to Syria’s Aleppo Province. The region has several fronts where Syrian rebels are up against pro-government forces. Aleppo Province is home to Syria’s largest city, Aleppo. Hezbollah, which claims to have sent thousands of fighters into the war and seen the loss of at least 1,000, has consistently supported pro-Syrian President Bashar Assad’s forces during the course of the six-year civil war. Nasrallah has described the fight for Aleppo and its province as the “greatest battle” of the Syrian war. The U.S. government, which considers Hezbollah a terrorist group, has consistently worked to undermine it financially and diplomatically. In December, Congress voted to impose sanctions on banks that deal with Hezbollah. In June, a U.S. State Department annual report described the Iranian government as completely intertwined with global terrorism. The State Department identified Iran as the world’s “foremost state sponsor of terrorism” as it has numerous times in past years. According to the State Department, Iran finances, trains, and equips a number of armed groups, including Hezbollah, the government of Syrian President Assad, Palestinian militant groups including Hamas, and others. 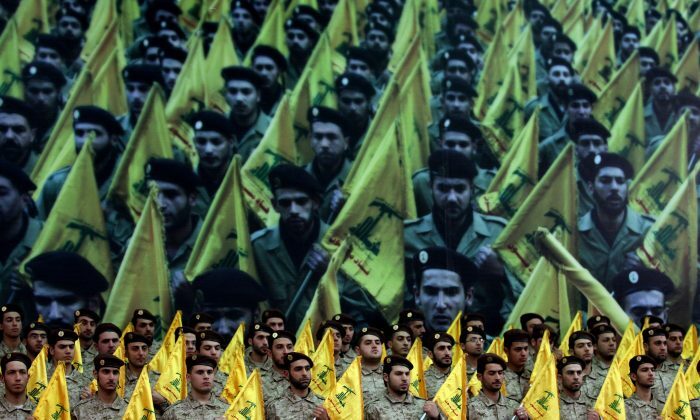 Hezbollah has long been seen as a threat to U.S. interests, but experts are sounding an increasingly loud alarm about the group. The key complication is the war in Syria and potential fall of Assad, which would be akin to cutting off Iran’s legs in the region by blocking the only land bridge between Iran and Lebanon: Syria. During March 2016 congressional hearings on the growing threat of Hezbollah, Tony Badran said as much, bluntly. Badran is a research fellow at the Foundation for Defense of Democracies and an expert on Hezbollah and Iran. “Tehran has deftly exploited the conflict, turning the strategic challenge it faces into an opportunity to expand its influence throughout the region,” Badran told the House Foreign Affairs Committee. That influence takes place largely in the form of regionally recruited and exploited Shiite militants. The operations are based on the model of Hezbollah, which Badran described as “the crown jewel of this regionwide network.” Its power in the region has been significantly boosted by its involvement in the war in Syria. It consists of factions in Syria, the Arab Gulf states, and Yemen. Militants are often trained by Hezbollah. The Lebanese Armed Forces (LAF) are considered by regional and security experts as an “auxiliary force” of Hezbollah. The Hezbollah-LAF relationship has become so blatant that earlier this year Saudi Arabia pulled out of a $3 billion financial support program for the LAF. Hezbollah branches have been operating in the Gulf since the 1980’s, according to the CIA. Also this year, two of the most powerful regional Arab coalitions took a strong stance against Hezbollah. The Gulf Cooperation Council and the Arab League both designated Hezbollah as a terrorist organization. Yet Badran warned that the United States has been slow to understand the current situation. “The LAF-Hezbollah synergy is broadly recognized in the region, with strategic implications that have been only dimly perceived in the United States,” said Badran. He notes that the Israeli military has also taken a stance against the LAF, warning it will be a major target if there is another war with Lebanon. Domestic connections don’t stop there, though. Badran said that the “weak and dysfunctional Lebanese state” is routinely exploited by Hezbollah. All of it leads back to Iran. “Through Hezbollah, Iran has made the Lebanese state complicit in its activities,” said Badran.